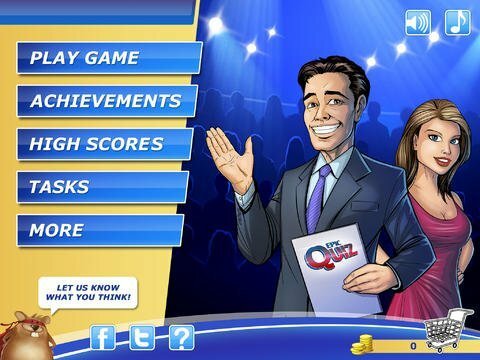 Clap your hands if you like quizzes. Ok, now you have clapped your hands you can keep reading, or press the shiny get from iTunes button. 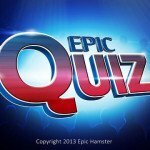 This is just how good Epic Quiz is, in a quiz-quality level. And it’s free to play, so no doubts about getting it. You could always delete it… But you won’t. Subcategories here are: Action, Celebrities, Comedy, Drama, Fantasy, Horror, Quotes, Romance, Science Fiction and Thriller. 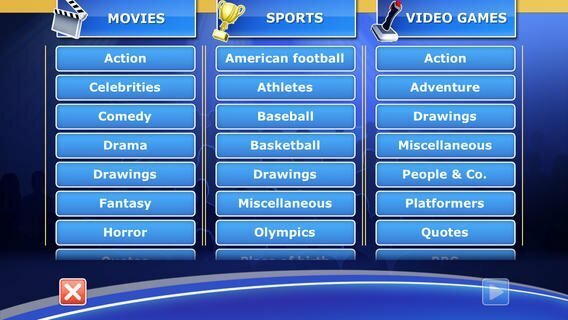 Subcategories here are: American football, Athletes, Baseball, Basketball, Miscellaneous, Olympics, Place of Birth, Rules and Soccer. Subcategories here are: Action, Adventure, Miscellaneous, People & Co, Platformers, Quotes, Role Playing Games, Real Time Strategy and eSports. You can select as many (or as few) of these categories as you’d like. To check the overall quality and number of questions, I made an experiment, selecting just soccer (where more or less I can know all answers if they are not country specific) and started to play. I found out that even in such a narrow theme questions took a long time to repeat, and most of the harder ones were still tricky to remember after seeing 2 or 3 times. Also, the quality of the questions was pretty high in this narrow set, covering a good chunk of the international and European soccer scene from the 70s until now. 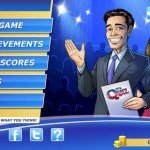 The game has a set of power-ups that enable you to freeze time, skip a question or show the correct answer, which are purchased with in-game currency. You earn this currency with each succesful game you have: the only in-app purchases are extra packs of tasks. 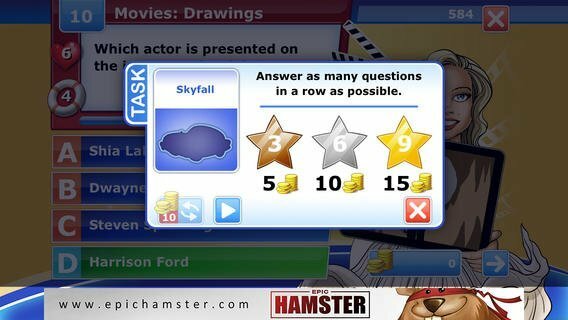 Occasionally (when on an answering streak for a certain category) you’ll get a task: 9 questions on a specific theme. For example, for soccer you have questions about Real Madrid. You’ll get a coin reward for answering 3, 6 or 9 questions, to allow you to buy more power-ups. 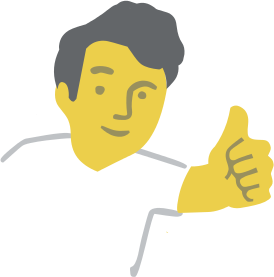 Some tasks are in-app purchases (for example, questions about Avatar or about Manchester United.) 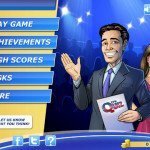 Getting coins is pretty easy by just playing, but tasks add an edge: the questions are tricky, and if you fail once you are out! 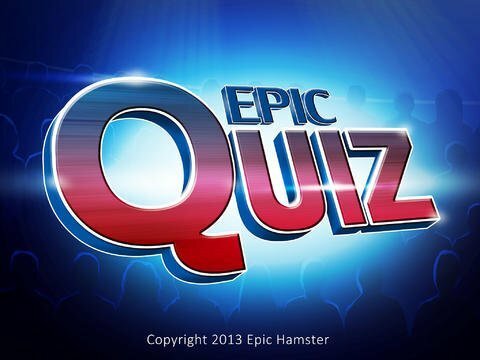 The only thing I’m missing in Epic Quiz is a multiplayer (pass-and-play) mode, where 2 or more people pass the iPad among themselves when they fail, trying to get as many points/questions answered as possible. As the game stands you can do it anyway (skipping the use of powerups) but having it “native” would make it far easier. 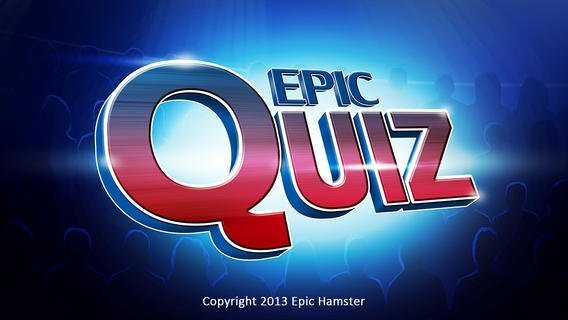 In short: Epic Quiz is a very good quiz game, probably the best we’ve seen on iDevices: it’s a surprisingly underdeveloped category. It only lacks native multiplayer, but it’s a very complete game in all other categories. Final Statement:Go get it, it's free! 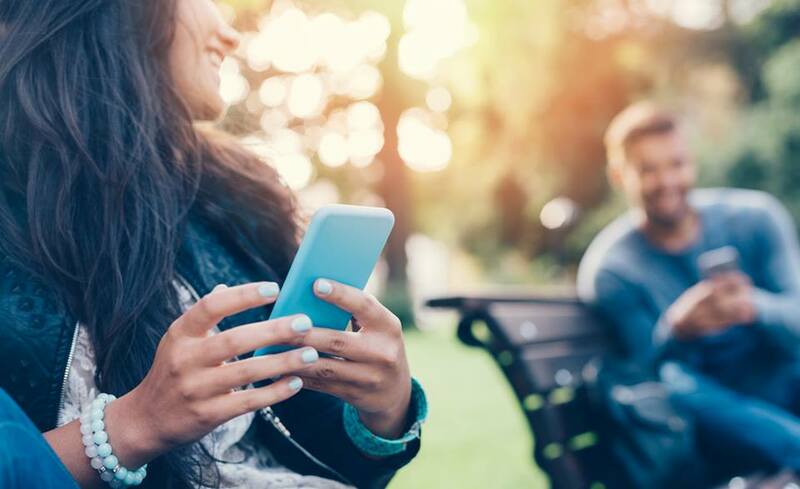 So you think you know it all? Prove it! 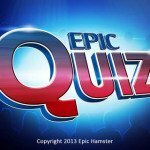 Epic Quiz is the most entertaining and challenging quiz on the App Store. And it's free to play! 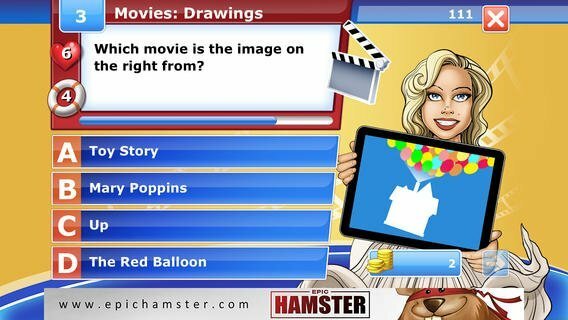 Thousands of questions from different categories are here to test your knowledge. 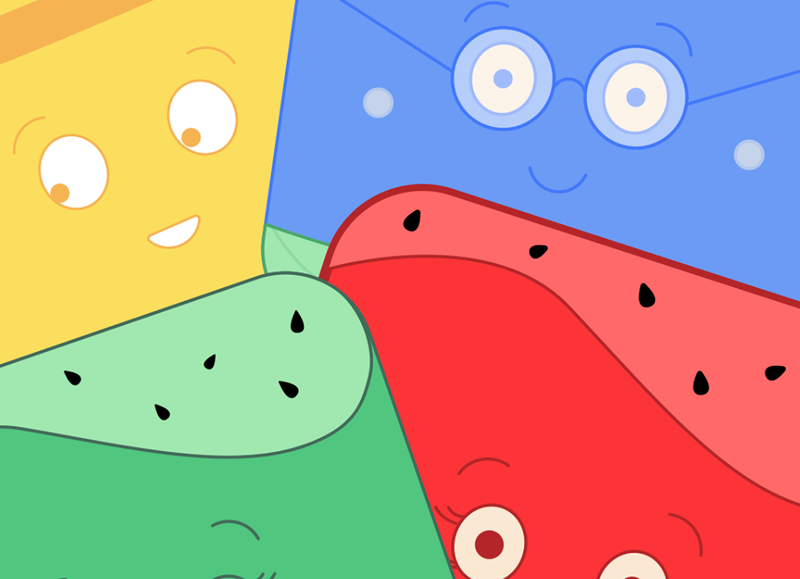 Tens of drawings and tasks are waiting to be unlocked.